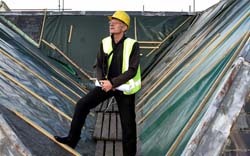 Work to restore the roof of the former Dunedin prison to its former glory has begun, project manager Guy Williams says. Mr Williams said contractors had spent the past two weeks stripping slate from the building’s roof, salvaging any in good condition. The Dunedin Prison Trust had acquired slate from Christchurch earthquake projects over the past 18 months, and would use it to replace damaged slate on the prison roof. 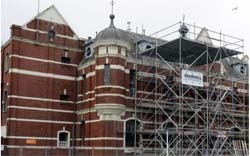 Scaffolding is rising outside the former Dunedin prison as stonemasons at a South Dunedin business prepare the way for the building to return to its original form. Tradespeople are expected to start work next month on what is one of the oldest prisons in New Zealand. The 120-year-old Victorian-style courtyard facility designed by John Campbell, who, six years later, was to design the neighbouring courthouse building, was decommissioned in 2007. It has housed axe murderers and baby killers, but now Dunedin's old prison is being transformed into a world-class tourist attraction. 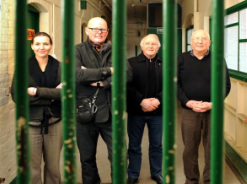 Dunedin Prison guard Ken Burt spent 28 years locking up criminals in the prison’s cells. Now he's locking up tourists. "Back in 1966, this is the general area where Constable Donald Stokes was murdered by two prisoners trying to escape." 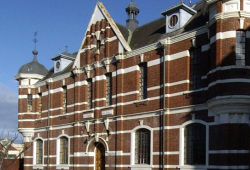 The historic Dunedin Prison was sold for $20,000, it has been revealed.The property, which has a capital value of $1.77 million, was sold to the Dunedin Prison Charitable Trust this week, after Ngai Tahu deferred its first right of refusal to buy the surplus Crown property. Dunedin Prison is about to be given a new lease of life, Ngai Tahu, in a significant act of goodwill, has deferred their First Right of Refusal to facilitate a direct sale between the Crown and the Dunedin Prison Charitable Trust. The group planning to buy the former Dunedin Prison has applied to the Dunedin City Council for rates relief for the Castle St building. 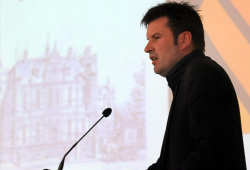 But Dunedin Prison Charitable Trust spokesman Stewart Harvey said on Friday the trust was still not in a position to confirm the purchase. The viability of restoring and developing the former Dunedin Prison as a tourist attraction should be known by the end of the year. The former Dunedin Prison is being sought by a local trust after Ngai Tahu turned down the right to buy the historic property. 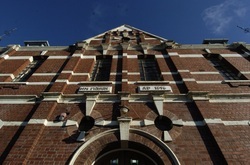 Stewart Harvey, of the Dunedin Prison Charitable Trust, said he believed the trust now had first option on the historic property. 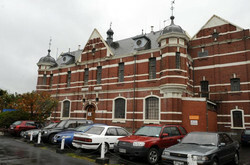 The Department of Corrections has revealed it is selling the decommissioned 113-year-old Dunedin Prison, but is keeping quiet about to whom the building may be sold, or its future use.